"Selective breeding has led to the development of dogs with a myriad of different coat characteristics and different grooming needs." Selective breeding has led to the development of dogs with a myriad of different coat characteristics and different grooming needs. Some breeds have hair that grows continuously and does not shed. These breeds of dog require regular trips to the 'doggy salon' for a shampoo and cut. Breeds such as huskies, malamutes and many retrievers have long, thick hair coats with both an outer coat of 'guard hairs' and an undercoat of fine hair that serves as an insulating layer. These breeds often go through two heavy seasonal shedding cycles per year (late spring and late fall), during which much of the undercoat falls out in clumps. Many short-haired breeds lack a distinctive undercoat, and these breeds often shed hair in low levels all year round. All dogs benefit from regular brushing to remove loose hairs and dead skin cells, to keep the coat free of dirt, debris, and external parasites, and to distribute natural skin oils along the hair shafts. Dogs with long, silky or curly coats require daily brushing to keep their hair from becoming tangled or matted, especially around the ears, in the armpits, or along the back of the legs. Dogs with short hair coats may require less frequent brushing. However, daily brushing of any dog that sheds will cut down dramatically on the amount of loose hair and pet dander floating around the home, and will also cut down on the amount of hair that the dog swallows in the course of self-grooming with its tongue. Regardless of the type of hair coat, you should inspect your dog's coat every day to make sure there are no tangles or clumps that have developed under the armpits, in the groin, or behind the ears. After a romp through the grass or in the woods, it is a good idea to look for burrs or grass awns that might have become trapped in the coat and could potentially cause irritation. If you regularly check your dog's coat and skin, you will also have a better chance of detecting any unusual lumps, bumps, or areas of sensitivity on your dog's body at an early stage. Different styles of brush work better on certain types of hair coats. 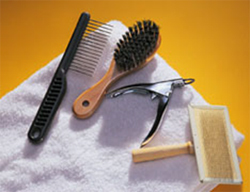 Slicker brushes (shown on the lower right in the diagram to the right) work well for dogs such as poodles, with curly non-shedding coats, while combs or stiff bristle brushes are good for dogs with medium length hair that sheds, such as retrievers. Brushes with short bristles or flexible 'grooming gloves' are good for smooth-coated dogs such as pointers or boxers. Long-toothed combs, especially ones made with several offset rows, are good for use in dogs with long hair, such as collies; these combs are also useful for removing tangled clumps of hair, or for removing clumps of loose undercoat hair when your dog is undergoing a seasonal shedding. Your breeder or groomer may have specific recommendations for a grooming tool that could work particularly well for your dog's type of coat. Whatever the choice of brush you use, it is important to be gentle when using it, and to avoid excessive pulling on tangles. If a tangle is small or relatively minor, or if your dog has just picked up a burr or grass awn, you may be able to gently remove it by brushing or combing it out. If, however, the tangle is extensive or there is a large clump of burrs or grass awns forming a mat, it may be necessary to cut out the clump of hair. In this case, you need to be extremely CAREFUL that you do not accidentally cut your dog's skin. When tangles are severe or extensive, we strongly recommend that you seek professional care, either from a dog groomer or from your veterinarian. If a matt has caused any sort of skin irritation, you should take your dog to the veterinarian so that the appropriate treatment can be prescribed. Most dogs require bathing on an occasional basis, usually when their coat becomes dirty or when they develop a 'doggy odor'. Non shedding breeds that have no health issues usually need to be bathed about every six to eight weeks, at the time of their regular grooming. Dogs that have a heavy undercoat will benefit from bathing in the spring or fall, when they are undergoing their seasonal shedding. "Most dogs require bathing on an occasional basis, usually when their coat becomes dirty or when they develop a 'doggy odor'." How often your individual dog needs to be bathed will vary somewhat with its age, lifestyle, type of hair coat, and underlying health status as discussed above. If you have a young puppy that is just being house trained and it accidentally soils itself, there is no question that it should be bathed immediately. A dog that enjoys running through puddles or jumping into water may need a bath after a stroll through the mud or a romp in a scum-covered pond. Some dogs enjoy rubbing their head in decomposing debris in the park, or rolling in objectionable objects, and will need a bath whenever this happens so that it is allowed back into the house! Finally, if your dog has allergies, your veterinarian may prescribe frequent bathing as part of the treatment regime - with some of these dogs, daily bathing may be necessary until the problem gets under control. If you find that your dog requires frequent bathing, you should discuss this with your veterinarian, who may recommend the use of a special shampoo, conditioning rinse, or 'dry shampoo' so that your furry friend does not develop skin problems associated with the repeated baths. No. Dogs should only be bathed in a shampoo that is formulated for use on dogs - their skin has a different thickness and pH than human skin, and human shampoo, including baby shampoo, is too harsh for their skin. For regular bathing, a hypoallergenic shampoo without any added perfumes is the best choice. You should always bathe your dog in warm water, partly for the comfort of the dog and partly because shampoos clean more effectively in warm water. Depending on the dog's size, you may find that it is convenient to bathe him in the laundry tub or the bathtub, or even in a walk-in shower stall. The common habit of washing dogs under the garden hose, using cold water, is not recommended, and is often the reason why dogs dislike being bathed. "Make sure you read the instructions on the shampoo label..."
After you have applied the shampoo, work it through the entire coat to remove all dirt and debris. 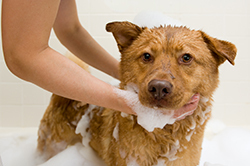 Some owners of dogs with particularly thick coats find that it is best to dilute the shampoo in some water so that it is easier to apply and rinse out. For routine bathing, you can rinse the shampoo out right away, but if you are using a medicated shampoo, it must be allowed to sit on the coat for 5-10 minutes before being rinsed out. Make sure you read the instructions on the shampoo label for the specific product that you are using, or follow your veterinarian's directions if you are using a medicated shampoo. Once the shampoo has done its job, it must be completely rinsed out. For best results, a conditioning product should be applied afterwards, to restore any lost moisture to the skin and minimize the development of dandruff after the bath. Dogs with long hair may be more comfortable if their coat is cut short for the summer, depending on the circumstances. This haircut should be done before the temperature becomes too high, so that the exposed skin does not become damaged from sunburn. Your take home message is that your pet's general coat appearance may be the first indicator of health problems. A healthy animal will not shed excessively and will have a shiny coat that is free from dandruff or greasiness. Before reaching for the bottle of shampoo, think about whether that lackluster coat could be telling you something else. If you have any concerns, contact your veterinarian for a consultation.